Jasmine make a number of entry level guitars but none of them come close to being as popular or as highly rated as their S-34C model. It has a street price around $100 and it was the only acoustic guitar in the sub $100 price range that had sufficiently high ratings for us to include in the first edition of our guide to The Best Acoustic Guitars and we're currently recommending it in our guide to Acoustic Guitars for Beginners. The Grand Orchestra shape of this guitar makes it a little easier for younger players to learn on, but its body shape is not limited in appeal to young guitarists. Customer reviews often cite the Jasmine S-34C's effectiveness as a student guitar with many guitar teachers recommending it. The general consensus is that this is the best sounding and most playable acoustic for $100. There were many customers who complained about quality issues such as damage to the finish or wood - it was unclear if these were shipping or quality control issues. Although some reviewers said it had a nice low action others complained that the action was so low that there was an unacceptable level of fret buzz which required the guitar to be replaced. If you only have $100 in your budget for a new acoustic guitar then our research strongly suggests this is the one you should purchase. 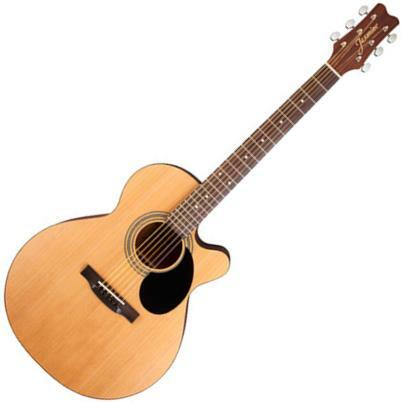 If your budget can stretch by an extra $30 then consider the Epiphone DR-100 instead. Click here for more information or to find a retailer for the Jasmine S-34CM.